This game is designed to introduce elementary students to coordinate geometry. Students roll 2 dice: one regular die and one die marked A-B-C-D-E-F. After rolling the dice, students form an ordered pair and capture a penguin, if there is one on that space. In the simplest version, students place the penguins on the board, and play to see who can capture more penguins. For a more challenging version, see the directions included with the game mat. Penguin pieces: The penguins pictured to the right were created from clothespins and doll stands, available at craft stores. They were assembled and spray painted black. Later, white and yellow acrylic craft paint was used to add details. A black sharpie pen added eyes. NOTE: Game pieces depicting two different penguins are included with the game mat. 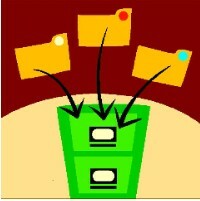 These can be laminated and cut out for student use. 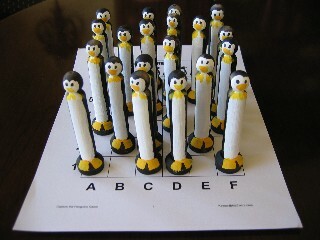 OR use any manipulatives to represent the penguins. Download Capture the Penguins game mat, penguin pieces, directions and recording sheet. Download Capture the Penguins 6x6 game mat uses 2 regular dice to graph coordinate pairs at intersections. See more Coordinate Geometry Activities. See 100th Day of School Activities for suggested math activities and math-literature connections to celebrate this milestone in the school year. See Math-Literature Connections: 100th Day of School. A study of quilting centers on the geometric use of slides, flips, turns and color patterns created by congruent squares and triangles. Students learn to identify these geometric transformations as they reproduce traditional quilt block patterns or create their own original patterns. See all February Math Activities.